Swanson Health Products now offers three options for the popular herb, hibiscus: organic tea, full spectrum hibiscus flower and hibiscus extract vegetarian capsules. 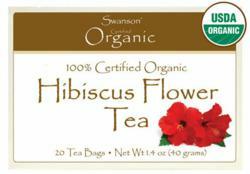 Swanson Organic Hibiscus Flower Tea is delicious and can be brewed hot or cold. The tea bags are the staple-free, non-bleached and made from recycled materials. This 100% USDA Organic tea has a fruity, tangy flavor, quickly becoming a Swanson customer favorite. For those who want the benefits of hibiscus but do not enjoy tea, Swanson Premium Full Spectrum Hibiscus Flower capsule supplement features a pure, whole powder. Swanson Superior Herbs Hibiscus Extract capsules feature UTIRose™ standardized extract. This vegetarian formula is standardized to 50% total phenolic compounds.